Home / Entertainment / Politics / Why Kris Aquino is so emotional in saying she will not run for Senator in 2019? Why Kris Aquino is so emotional in saying she will not run for Senator in 2019? 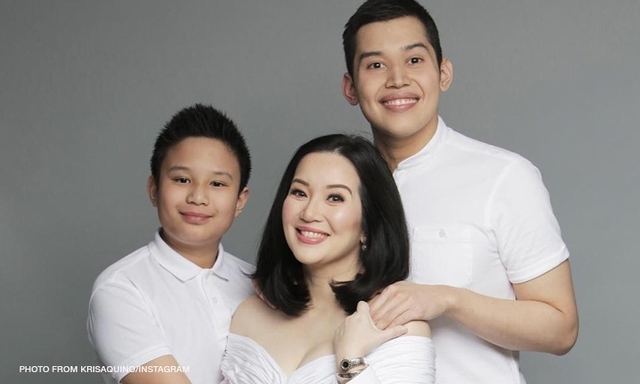 The "Queen of All Media" and daughter of late Senator Ninoy Aquino and the late president Cory Aquino and youngest sister of former President Noynoy Aquino, Kris Aquino insists she will never go into politics even though her name was included in the recent Pulse Asia survey. Kris Aquino, well known personality in both showbiz and politics just can't ignore the fact that she is popular in both industry like just she mentioned before 'she is a Aquino'. However, following reasons that she is alone raising her two boy, Joshua and Bimby, Kris needs to give her full time to monitor especially Joshua who is a special child. "I've taken pride in my professionalism, my 100% honesty about financial dealings, and my total respect for endorsement contracts. Direcho na – alam kong pumalpak ako in the past sa personal life so bumabawi ako ng bongga sa trabaho ko at sa pagsusumikap na maging mabuting ina. Because of this ALLOW ME TO FIRMLY SAY THAT I WON'T SEEK ANY NATIONAL ELECTIVE POST IN 2019," she said. "I am the only parent providing for the financial & emotional well being of Kuya Josh is in the autism spectrum & will need lifelong care, therapy & intervention; and my bunso, Bimb is only 11 years old. HINDI PO AKO TATAKBO PARA SA SENADO IN 2019," she added. Kris also said that to be fair with her cousin Senator Bam Aquino, she decided not to run for Senator in 2019. The senator said that inclusion of two Aquino's may result in "divided choice for voters." So, it would definitely be a big lost to Kris Aquino's cousin since if Kris will run for Senator for sure she may have a chance to win. In the 6 weeks that i quietly suffered because of financial abuse & betrayal we uncovered being done to me by someone i had complete trust & faith in, not to mention the millions he earned from running KCAP & negotiating my endorsements- the stress, inability to eat & sleep properly caused my weight to drop to under 54 kilos. I apologize to all my endorsements & KCAP brand partners for paying the price of an unhealthy Kris Aquino struggling to again find her inner WARRIOR. I’ve asked 2 BRILLIANT legal minds- Atty Sig Fortun & Atty Florin Hilbay to take charge of my legal team in my quest for JUSTICE. i shall pray to stop blaming myself for being made a fool of, because it is a life lesson of knowing when & how much to trust,and how to place safeguards to protect myself & my business interests."